Brain Dump on Updated Atwoods – Teach. Brian. Teach. This semester, we again did half Atwood’s to explore data about how force effects acceleration. We use force sensor to measure tension in string, and a motion detector to examine velocity vs time graphs. I model the first data collection point, since there are a lot of little things to get right and notice. Next time, I definitely want to still model the fist point, but use clicker questions or what do you notice questions to help interpret the graphs. Make sure motion detector is seeing cart properly along entire track. Make sure friction pad is up and not rubbing on track. Make sure masses and string are free to move with out obstruction or rubbing. Replicate and verify one of their groups data point. 1. Replicate another groups data point, which you think perhaps is off in some way. This invites looking for patterns and skepticism. 2. Request that another group replicate your data point. This invites idea of collaboration and independent review. The carts are designed to be 1.0 kg to 2 sig figs. 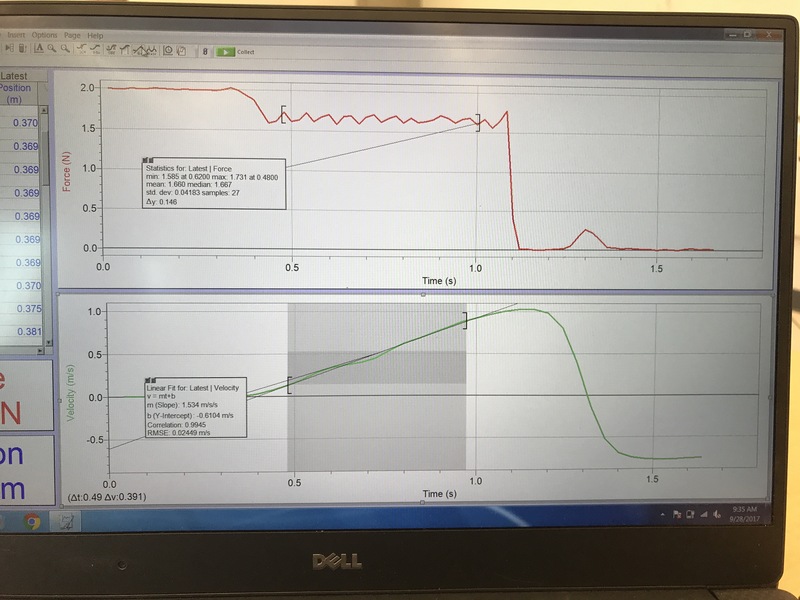 We aggregate our data in a table and a graph, of acceleration vs force. And then We spend a fair bit of the day making sense of the data and the graph and then introducing Newton’s 2nd law. Examining the special case of 1.0kg case specifically really helps. After, There is some direct instruction and clicker questions, a lot around examining mock experiments of different carts to get at mass. Next time, I’d like to do have handouts for students to examine the mock data (instead of a clicker question), and end day with a ranking task (laminated card sort) for Newtons 2nd law. 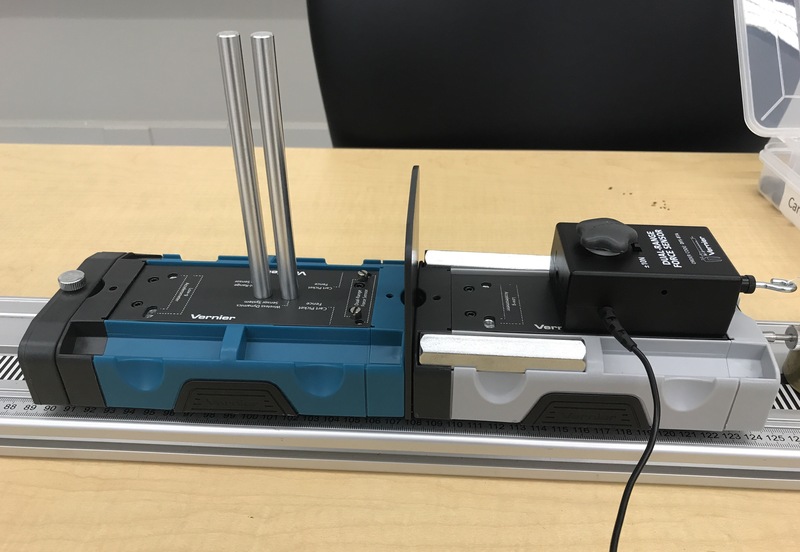 Our day ends with driving at Newton’s 1st law with hoverpucks, bowling balls, and phet sims. This year I first asked what happens to force when we lose contact. And then we talk about what happens to speed. We had a great discussion about assumptions. Physics Two Brain Dump: superposition, reflections, and standing waves. Brian, can you tell me a bit more about why you set the carts up the way you do? 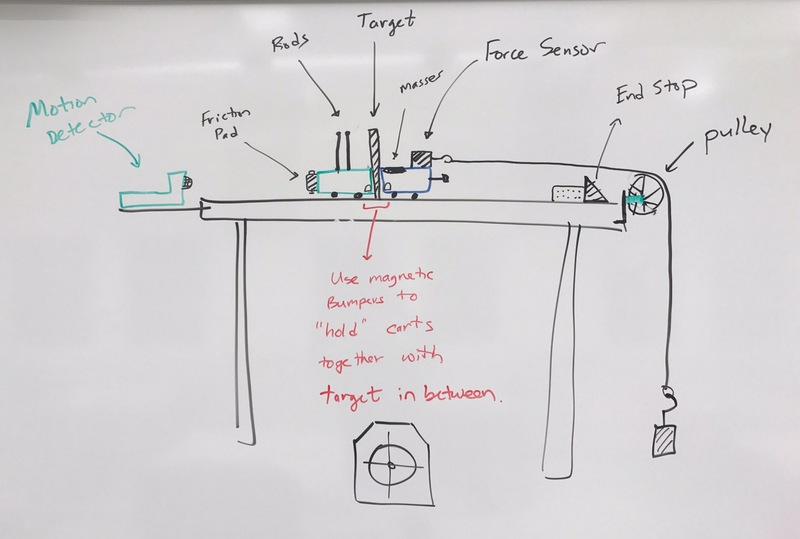 What’s the point of having two carts connected by magnets separated by the target? And the friction pad? Is that just an extension you do at the end? It’s just a crazy way to get 1.0 kg pretty exact.